Travel to the land down under, where the sun belts down, and the plains are vast. Click here to play! There are riches to be made in this exotic country, so take yourself to Australia and become the Kanga King. This adventurous slot is played across 5 reels and 9 pay lines, where more lines activated means that you have more chances for spinning up winning combinations. The Kangaroo is Wild and can be substituted for any other symbol on the reels except Scatters. Land the best combo, and you’ll find yourself spinning up exciting Free Spins! The Shed is Scattered and can appear anywhere on the reels, with two or more, in order to earn a payout. If you are looking for the biggest and best payouts, try spinning up all five Bushmen on an active pay line, and you’ll win yourself 3000 times your original bet! The Kanga King is a lucrative title indeed, so start playing for that crown today! Sheds are Scattered and when two or more appear on the reels, you will always earn a payout. 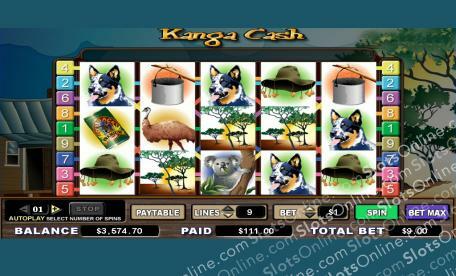 The Kangaroo is Wild, can become any other symbol on the reels bar Scatters, and can earn you some Free Spins when it shows up on reels one and five.